California state agencies, universities and commissions won't be allowed to send their employees to Texas after the California attorney general declared a Texas law discriminatory. Saying that a new Texas law allowing child welfare providers to deny adoptions to parents based on "sincerely held religious beliefs" is discriminatory, California's attorney general on Thursday banned state-funded travel to Texas. The attorney general's office said in a news release that Texas' House Bill 3859 "allows foster care agencies to discriminate against children in foster care and potentially disqualify LGBT families from the state’s foster and adoption system." Therefore, California agencies, public universities and boards won't be able to pay for their employees or board members to travel to Texas for work-related trips, the state's attorney general declared. "While the California DOJ works to protect the rights of all our people, discriminatory laws in any part of our country send all of us several steps back," said Xavier Becerra, the California attorney general. "That's why when California said we would not tolerate discrimination against LGBTQ members of our community, we meant it." The decision drew a mocking response from the office of Texas Gov. Greg Abbott, a Republican who signed the bill into law this month. 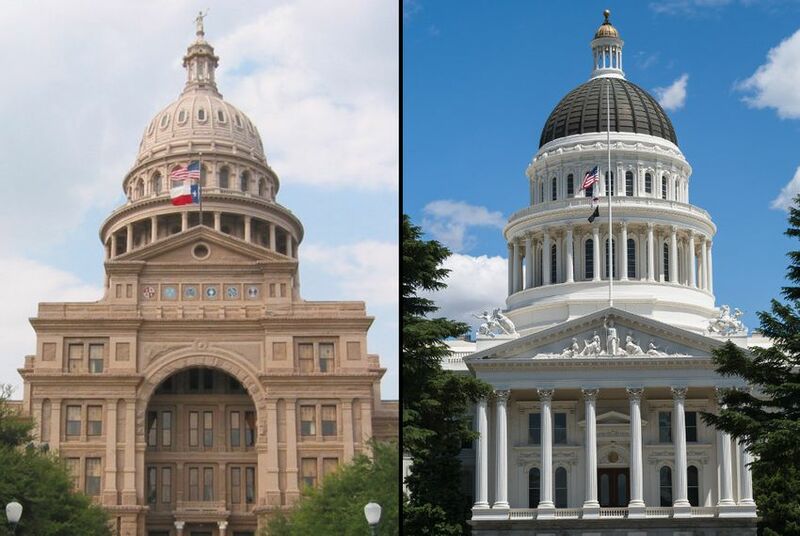 "California may be able to stop their state employees," said Abbott spokesman John Wittman, "but they can’t stop all the businesses that are fleeing over taxation and regulation, and relocating to Texas." Becerra has the authority to issue such a ban, thanks to a law that went into effect Jan. 1 prohibiting state-funded travel to states that have discriminatory laws on the books. The new law requires the attorney general to keep a list of such discriminatory laws. Many people speculated during the 2017 regular legislative session that Texas would be added to the list if it passed a bill setting rules for which bathrooms transgender people can use. That legislation failed during the regular session. Meanwhile, the adoption bill wasn't really on the radar of people concerned about California state travel. HB 3859, authored by Rep. James Frank, R-Wichita Falls, says that faith-based organizations can also place a child in a religious school; deny referrals for certain contraceptives, drugs or devices; and refuse to contract with other organizations that don't share their religious beliefs. Under the law, if an organization refuses services to children or prospective parents on religious grounds, they will be required to refer the child or parent to a different organization. It was a controversial bill. LGBT groups said it "used religion as a weapon." Religious groups said it allowed them to serve children without violating their core beliefs. Alabama, Kentucky and South Dakota were also added to the list of states with California travel bans. It's not immediately clear what the economic impact of the decision will have on Texas. One of the key consequences could involve higher education — and college sports in particular. Researchers and staff members from universities often travel to Texas for conferences. And California college sports teams play in Texas fairly regularly. Several major sports bowl games and tournaments are played here — including the men's college basketball Final Four in San Antonio in 2018. The University of California, Los Angeles played a road football game at Texas A&M University last season. The University of California, Berkeley played at the University of Texas at Austin a year earlier. The California law allows for exceptions for contracts that are already in place, and it's unclear whether the state's teams would be banned from playing in the Final Four. But the Los Angeles Times reported in February that UCLA has stopped scheduling games against teams in banned states.